The newly designed ball head lock can impose a stronger lock on the ball head. The texture of the metal anode oxidation process, can make the ball head color more lasting and beautiful. The quick release plate was designed in an universal 1/4 inch size , which is suitable for most digital cameras. Thanks to the Zomei outstanding manufacturing technology,the ball head is forged from one block of high quality aluminum alloy, and it is sturdy and durable. 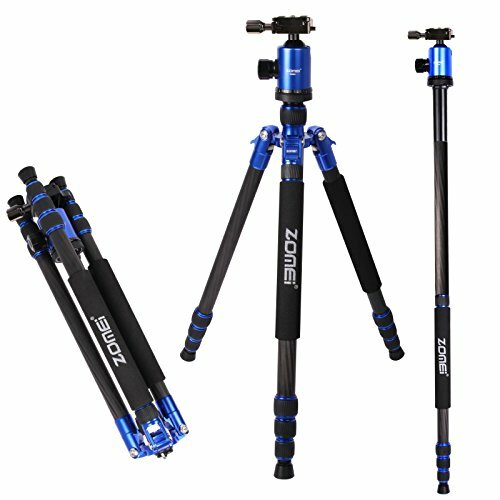 This is an ultra-light, full-size tripod that is among the lightest, most portable and affordable in its class. Constructed of super-strong and lightweight carbon fiber with eight-layer construction, it also has a super-strong, lightweight magnesium reverse-folding chassis that makes it extremely compact when on the go. COMPACT FOR TRAVEL: With a folded length only 19", this tripod can be put in to the carry on luggage for most of the airlines (limit 22" in length). The tripod legs can be inverted and folded back 180 degree and save your space and make it small enough to carry everywhere. Weight only 3.4 lbs. BONUS BUILD IN MONOPOD: This tripod could be converted into a full size monopod by screwing together the removeable center column and tripod leg. HEAVY DUTY: New generation of high-density carbon fiber tube,with rigid intensity,shockproof,heat and corrosion resistance. Max load capacity 13.5KG(30lbs), super light weight but support heavy duty. EASY SETUP: Screw the quick-release mounting plate onto your camera and with the push of a button you can remove your camera from the tripod for mobility. Rotating leg locks control four adjustable leg sections that glide in and out with ease, offers you a height range of 18" to 68". STABLE: Column Counter Weight Hook, located in the bottom of the center-column, allows you to hang additional weight for increased stability. With a precise Ball Head,Quick Release Plate with two integral bubble level to prevent uneven pans and head movements, obtain accurate panoramas picture with 360-degree panning.